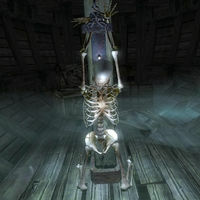 Grantham Blakeley is a Breton warrior whose skeleton is found bound to a post inside The Emma May, a shipwreck located at the Mouth of the Panther, along the coast of Niben Bay. The crew of the Emma May, led by crew mate Gable, mutinied against Captain Laughton for his decision to sail on in the face of the dangerous storm while traveling to the Imperial City via the Niben Bay. Grantham was the sole crew member who stood by his captain, and was chained up below decks by the mutineers. The ship subsequently sank in the treacherous inlet known as the Mouth of the Panther, losing all hands aboard and condemning Grantham's spirit to roam the shores of Niben Bay. After you have unchained the skeleton in the depths of The Emma May, the ghostly incarnation of Grantham Blakeley will emerge in front of you and speak: "I knew one day someone with unyielding virtue would heed my words and speed my release. You risked much to perform such a selfless act. This noble deed will not go unrewarded. Look upon the ground in this prison. There you will find a map to my gratitude. I thank you with all my heart. Farewell." After this speech, the ghost will leave behind a valuable treasure map and disappear in a mist. The ghost wears a set of lower class clothing: a coarse linen shirt, coarse linens and a pair of oiled linen shoes. He also carries a small amount of gold. Grantham's daughter, Angelie, lives in the Talos Plaza District of the Imperial City. 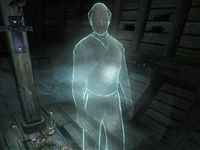 His first lines are also spoken by the test NPC Alban Corinis, although they are spoken in an Imperial rather than Breton voice and do not have the filters applied to them to make them sound ghostly.